Ashampoo announced a moment ago that it has changed the license of the company's Ashampoo Uninstaller 5 program for Windows from shareware to freeware. The program, which was available for $49.99 previously, can now be downloaded free of charge. Please note that you need to register an account using a valid email address before you can unlock the application using a license key that you get afterwards. 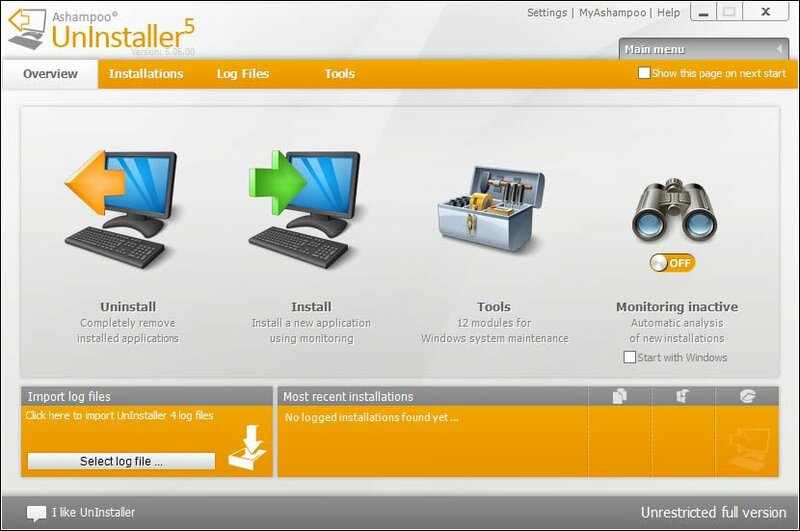 We have reviewed Ashampoo Uninstaller 5 before here on Ghacks, about three years ago to be precise, and one could come to the conclusion that Ashampoo is just getting rid of a program that has not received any notable updates in that time. This is apparently not the case; the last update of the program dates back to August 2015. To get the program, visit the official Uninstaller 5 page on the Ashampoo website. There you find a download option. When you launch the program you get an option to get a free license key which leads to the Ashampoo website again where you are asked to enter an email address. A link is attached to an email that you get once you submit your address on the page which takes you to steps 2 and 3 of the process. Step 2 asks you to fill out a basic profile and while you can do that, you may skip it as well. The license key is shown in step 3 which you need to copy and enter in Ashampoo Uninstaller 5 to unlock the application. Ashampoo Uninstaller 5 supports the removal of installed programs on Windows. Like comparable applications such as Revo Uninstaller, it allows you to scan for leftovers after the installation process. 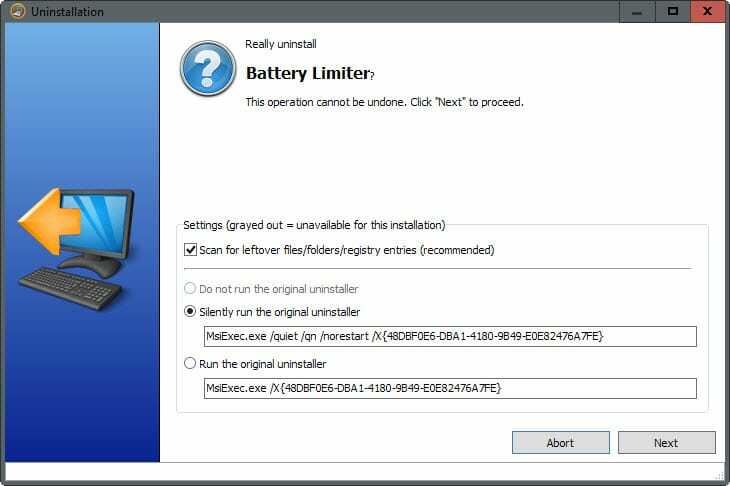 What sets it apart is that it can log installations of programs while it is running on the system to make sure every last bit is removed when you uninstall the program using Uninstaller 5. Before you can do that, it is necessary to enable the monitoring of new installations in the program's main interface. If you don't want to do that, you may use the "install" option for individual installers to monitor that installation. It turns the monitoring on for the duration of the installation and turns it off automatically again once it completes. The changes that an installer makes to the system are displayed in an overlay during the entire time. You do get a "final" prompt in the end as well listing the number of files and Registry values that the installer added or changed on the system. These information can be exported from the "log files" section of Ashampoo Uninstaller 5 so that you can look them up whenever the need arises. The program will use the information during clean-up should you decide to remove the program from your system at a later point in time. Ashampoo Uninstaller 5 ships with a set of tools that may be of use as well. This includes several clean-up programs to remove temporary files, file defragmentation, managing services and startup items, or options to undelete previously deleted files. The new price -- read free -- makes Ashampoo Uninstaller more attractive especially since it offers more than just a scan for leftovers. The logging of installations is quite useful, not only when you remove a previously logged program again but also for verification to find out about the changes that an installer made to a system. Could be quite useful in combination with virtualization or a sandbox. Ashampoo has turned the commercial program Ashampoo Uninstaller 5 into a freeware program. Since on your last test Revo came on top of the other 2 uninstallers, Geek & IOBit, could you run another test, this time Ashampoo versus Revo? Red, I put it on my to-do list but cannot make promises right now. the company’s website is gone. As you maybe know Revo Free does not handle 64-bit applications, only the pro/paid version does. Comparing Ashampoo to Revo would be biased I guess. I wouldn’t say biased, tho. A lot of people are still using 32 bit programs, that won’t change in the near future. Besides, the test should show how the two uninstallers handle the removing of the programs, not if they’re capable of handling 64 bit, we already know Ashampoo (free) has an advantage over. Strange. Once installed and Profile created, the program indicates Registered Trial Version. 40 days remaining. That is not Free. I will contact Ashampoo for Clarification. This is really strange. I got “unrestricted full version”, and confirmation from Ashampoo that the program is now free. Historically Ashampoo has always installed spyware – so proceed with caution. I stopped using their products a couple years ago for that reason. Total Uninstall is the best! I guess if Ashampoo Uninstaller is constantly monitoring what the installed programs do (in order to uninstall them completely in the future, including all traces of them), then I guess that means the Ashampoo Uninstaller must run constantly in the background? If so I wonder how much resources it uses up? And of course having a program constantly running and monitoring things in the background does raise some questions about the trustworthiness of that company and it’s program. My solution has been to create a “PERFECT” version of my computer, with all the major programs I use and trust installed. I then clone that perfect version of my computer onto a separate hard-drive, and use the cloned hard drive for daily use, allowing me to install and experiment with all kinds of programs without worry. And then every so often, I refresh my daily working hard-drive, by recloning the perfect version back onto it. Doing that, I never really felt the need for a good uninstaller program. You can enable the monitoring for installations only, but need to activate it then manually each time. I don’t know how a uninstaller program can truly track all changes to a computer system unless the uninstaller does a “before and after” snapshot of the hard drive and the registry and compares the difference. The earlier versions of Ashmapoo Uninstaller did that, and did it pretty well. As far as I can tell, version 5 does not do that. I abandoned Uninstaller ver 5 years ago, because it appear to me that it was only using the program’s own uninstaller routine to remove programs… not comparing a before and after snapshot. I just didn’t see anything special about it. Without a doubt, Total Uninstaller is the best in class. But, it don’t come cheap. According to Ashampoo, the program is Not Free, but a commercial release. I received a 40 day license by e-mail. It’s confusing. On the main product page they say “NOW FOR FREE”, but when you click the download link and then install it, they only mention a 40-day free trial. The follow-up email also says it’s a 40-day trial. First off, I doubt they have any secret knowledge or original real-time monitoring. I believe what their program does is to simply monitor the install logs of the program being installed. That’s not nearly as accurate or effective as logging the differences between a before and after snapshot of the system. But, it’s far more efficient. An efficient pile of crap is still a pile of crap, though. The previous paragraph is support by their second highlight point… “only records modifications cause by installers.” Exactly my point. It doesn’t do anything special. It simply accepts the installer’s log as the means by which to reverse any changes made to the computer. It does absolutely nothing if the installer requires a reboot at the end of the installation routine. FAIL!